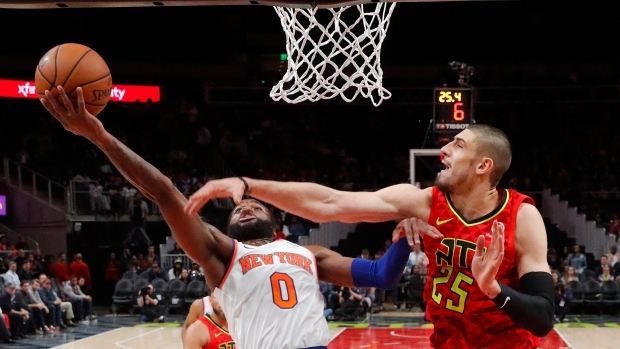 ATLANTA — Knicks coach David Fizdale gives his team credit for not giving up during a losing streak that lasted nearly six weeks. "I keep talking about this team's character," Fizdale said. "It would've been very easy for us to check out and get on to wherever we're going to go, but we were desperate men. Those guys wanted this game really badly, and they came out and showed it." Dennis Smith Jr. scored 19 points and New York snapped a franchise-worst, 18-game losing streak with a 106-91 victory over the Atlanta Hawks on Thursday night. The Knicks ended their longest skid within a single season with their first victory since Jan. 4 at the Los Angeles Lakers. New York, with the Eastern Conference's worst record and second-worst overall, had dropped 26 of 27. Kadeem Allen and John Jenkins each added 14 points. Damyean Dotson finished with 13 points and DeAndre Jordan had 13 rebounds for New York, which never trailed and only was tied twice, in the second quarter. "I think we did a great job of guarding the pick-and-rolls tonight," Smith said. "Our bigs did a good job of calling out the screens and switching and not giving them too many second chances." The Hawks, coming off an exciting victory over the Lakers two nights earlier, were flat throughout. They never pulled within single digits after John Collins' hook shot made it 87-78 with 9:39 remaining. Dewayne Dedmon led Atlanta with 21 points. Trae Young had 16 points and 11 assists. The Knicks were up 14-0 before ending the first with a 28-13 lead. Mitchell Robinson closed the period by blocking DeAndre' Bembry's 3-point attempt. Atlanta missed its first 11 shots as its starters combined for two points. "We can't start the game like we did and expect to get a win," Young said. "We've just got to learn from it and get better and regroup after the All-Star Game." The Hawks, who trailed 54-51 at halftime, have lost four of five. "I like where we're headed," Atlanta coach Lloyd Pierce said of his team's overall play this season. "As a first-time coach, I didn't know if I'd be fighting players every day or disgruntled guys or guys not buying into it, but I think the guys buy into it and they enjoy each other. They enjoy my staff, which is very important." Knicks: Mario Hezonja missed the game with a left leg contusion. Fizdale said Hezonja was kicked in Wednesday's home loss to Philadelphia. ... Luke Kornet made his 11th start and finished with 11 points. Hawks: Young began the game averaging 16.9 points and 7.6 assists. Since 1997-98, only Chris Paul in 2005-06 and John Wall in 2010-11 averaged at least 16 points and seven assists over a full rookie season. Fizdale wants the Knicks to use the upcoming All-Star break to rest and maintain their conditioning. "I'm not letting my foot off the gas," he said with a smile. Former President Jimmy Carter, 94, and his wife Rosalynn, 91, attended the game and were introduced to a standing ovation during a timeout early in the first. The Hawks did a video presentation of Carter's career in humanitarian causes, politics and philanthropy. Carter, the Nobel Peace Prize winner in 2002, just won his third Grammy for best spoken word album on "Faith: A Journey for All." The Hawks held a Love Wins Pride Night promotion that featured the Atlanta Gay Men's Chorus singing the national anthem and the team calling attention throughout the night to the LGBT community. The outside "Atlanta" facade of State Farm Arena was lit in rainbow colours. The Hawks dressed their mascot Harry in a rainbow Mohawk and had him waving a large rainbow flag with their logo in the centre. Knicks: Host Minnesota on Feb. 22. Hawks: Host Detroit on Feb. 22.